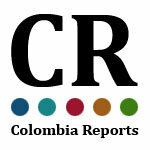 Memo to first-time visitors to Colombia, especially if you’re heading to the pristine beaches, old-world colonial cities, jungles, deserts, eco-parks and diving meccas along the country’s Caribbean coast: The local tourism folks want you to know they’ve come up with a way to make you less of a stranger to the 150-mile-long coastal strip before you set out to see it. 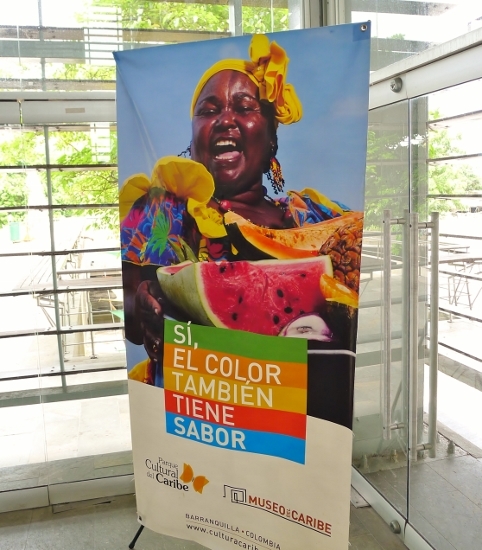 Colorful poster greets visitors to the museum.What they did was to build a high-tech interactive museum — the Museum of the Caribbean — where visitors can get immersed in the culture and history of the area. It’s in the regional capital of Barranquilla, a bustling city of a million people roughly half-way along the coast. The museum fills five floors and has five sections: nature, people, words, action and expression. Guides take visitors on tours of the museum in which you’ll see and hear those five subjects come alive in everything from the early Indian roots of the region to the Spanish conquest to Colombia’s fight for independence to its modern-day culture. 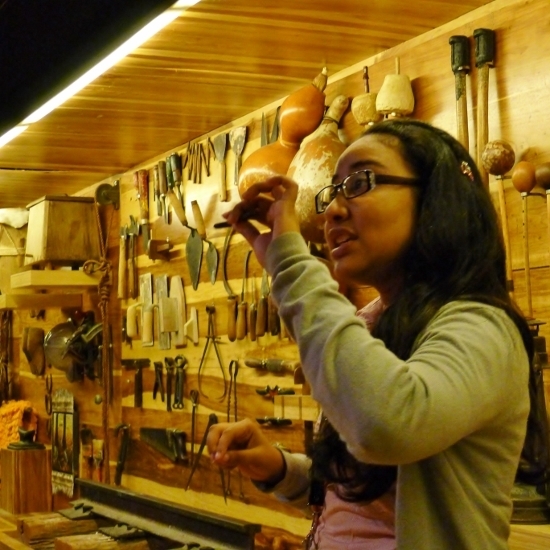 Museum guide explains evolution of local tools.You’ll notice the museum uses lots of ways to pep up your tour. For instance, you’ll watch history unfold on a huge panoramic screen… you’ll press buttons and tap icons to make the exhibits almost roll over and bark… you’ll step into booths where you’ll hear different kinds of Caribbean music. You’ll even get a chance to dance to the booty-shaking beats of tunes like bullerengue, chalupa and compas. Other exhibits grab the attention of the museum’s visitors using imaginative stagecraft. Check out the way arrangement and lighting liven up what might have been a less than exciting collection of hammers, spades, chisels and other historic working tools of the region. 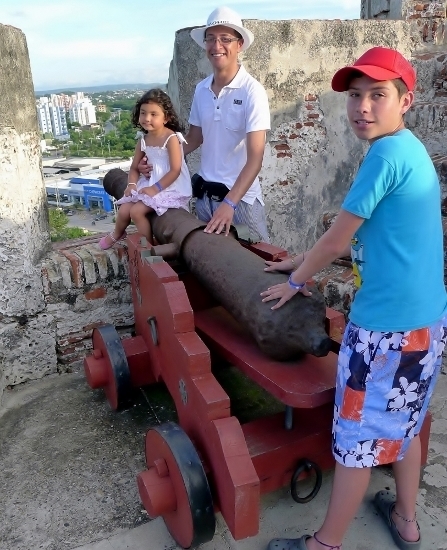 Tourists pose on a cannon overlooking Cartagena. So now you know all about the region’s Indian-Spanish-African culture and you’re ready for some serious sightseeing. Up high on your list will likely be a tour of the walled city of Cartagena a couple of hours down the coast west of Barranquilla. There, you can huff and puff your way up the ramparts of a towering Spanish super-fort overlooking a harbor where treasure galleons once gathered to sail to Spain. After that you can get a taste of Cartagena’s colonial elegance by wandering around an area of this city of a million-plus people called “Old Town.” You’ll stroll through cobbled lanes lined with buildings painted in pastel blues, greens, yellows, reds, pinks and browns, many of them the mansions of shipping barons and bankers in the years of the treasure fleets. 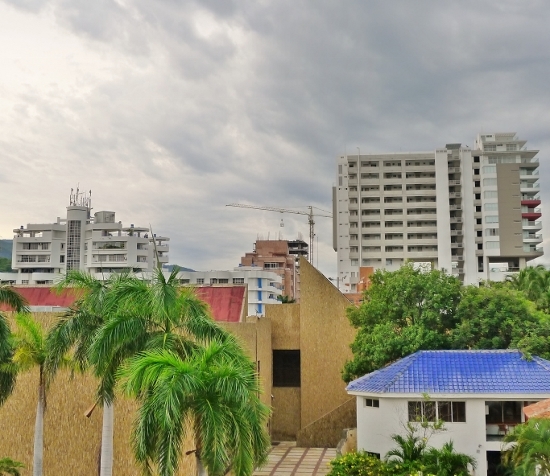 Hotels and condos are springing up outside the historic city of Santa Marta.Up the coast east of Barranquilla is the fast-growing resort area of Santa Marta (back in the museum you learned it was the first Spanish settlement in Colombia). Also waiting for you there are the nearby eco-treasures of two of the country’s 56 national parks, Tayrona — once the home of prehistoric hunter-gatherers (you learned all about them, too) — and the virgin mountain wonderland of the Sierra Nevada de Santa Marta (also spotlighted at the museum). Staying there: Barranquilla, Cartagena and Santa Marta each offer dozens of tourist-class hotels in and around the cities. Getting there: Flights from most major U.S. gateways to the recently upgraded jetport at Barranquilla are scheduled by way of flight connections at Miami, Bogota (Colombia) and Panama City (Panama). Nonstop flights to Cartagena are scheduled from gateways such as New York-JFK, Miami and Fort Lauderdale in addition to a number of connecting schedules.